This makeover reveal has been on hold for about two weeks because I can’t count. It all started when I got a text from a friend of Mom Baker. She lives in a development just down the road from me, and she has sold me amazing pieces in the past. 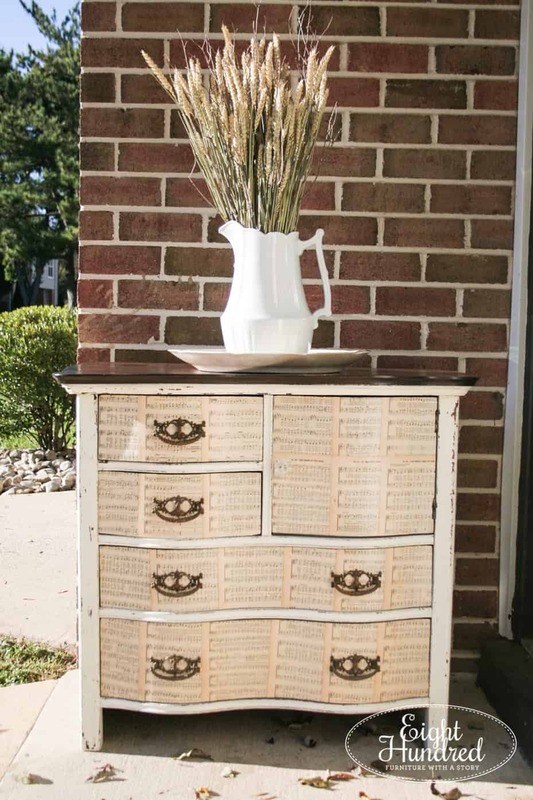 This time, it was a wood dresser. I took one look at the photo and was over to pick it up in a matter of hours. The dresser was tall with lots of drawers. It was solid in its construction and had been used by their family for years. It had been stripped in the past and the current finish was inconsistent and a bit blotchy. 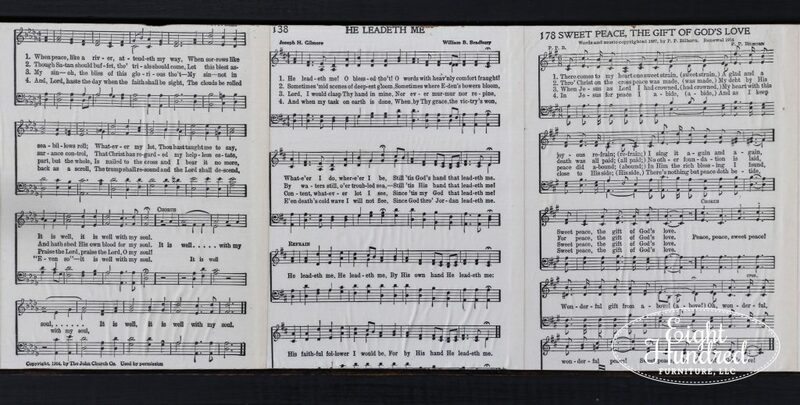 I decided it would be the perfect contestant for a classic sheet music makeover! 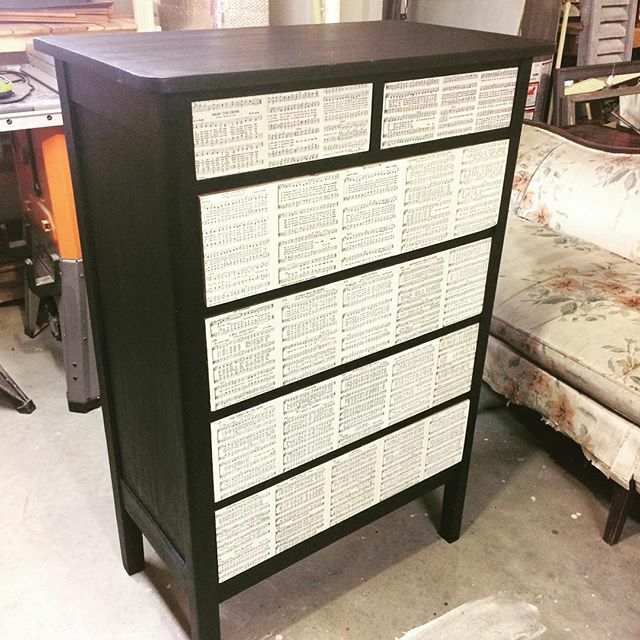 I’ve done pieces that have sheet music on the drawers in the past and they’ve all turned out so well! As you can see, my photography has come quite a long way as well! 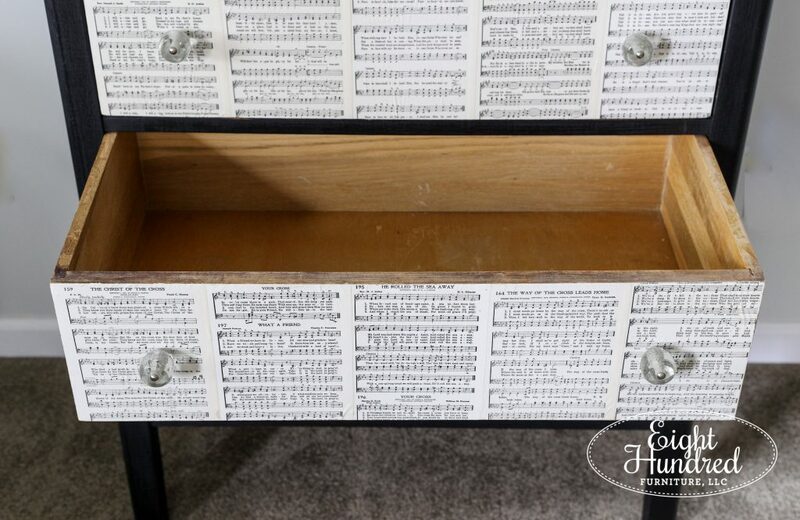 I was running low on sheet music, so I picked up a few vintage hymnals from a vendor at Antiques at Silver Bell Farm, and used good ‘ol Mod Podge to decoupage the fronts of the drawers of the dresser. You can read how I’ve done this in the past in this post. 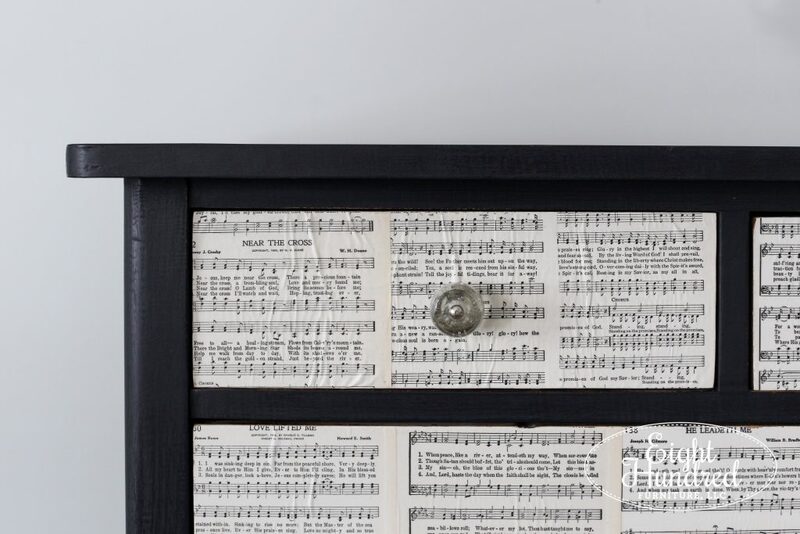 To accentuate the lyrics and music notes on the sheet music, I painted the body of the dresser in Miss Mustard Seed’s Milk Paint‘s soft black, Typewriter. To seal the dresser, I applied my favorite topcoat for dark colors, Hemp Oil. 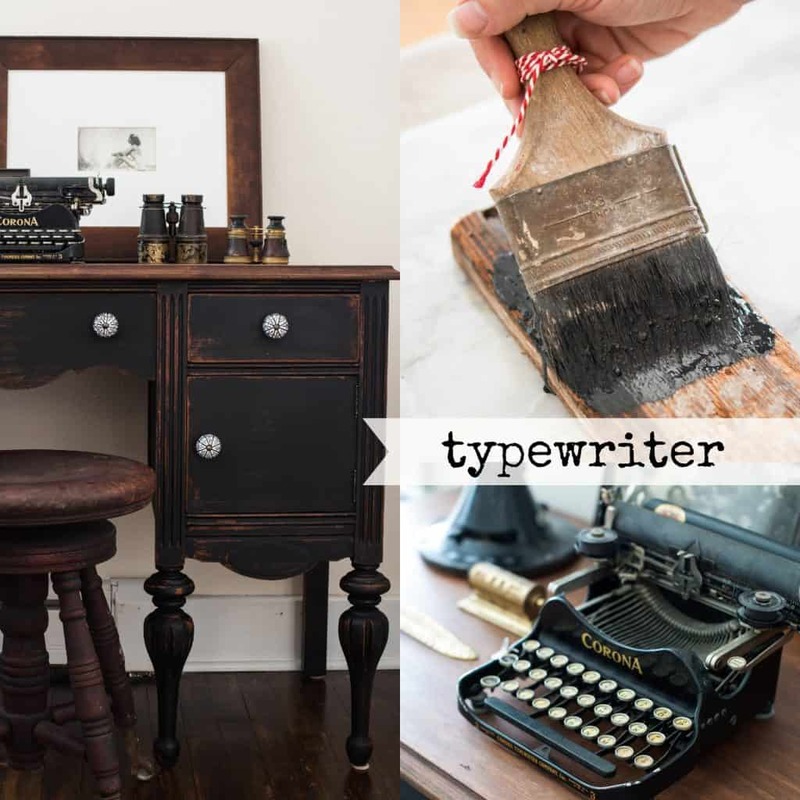 Hemp Oil truly brings dark colors like Typewriter, Artissimo, Boxwood and Curio to life! You can also add a layer of clear Furniture Wax over top for extra protection. 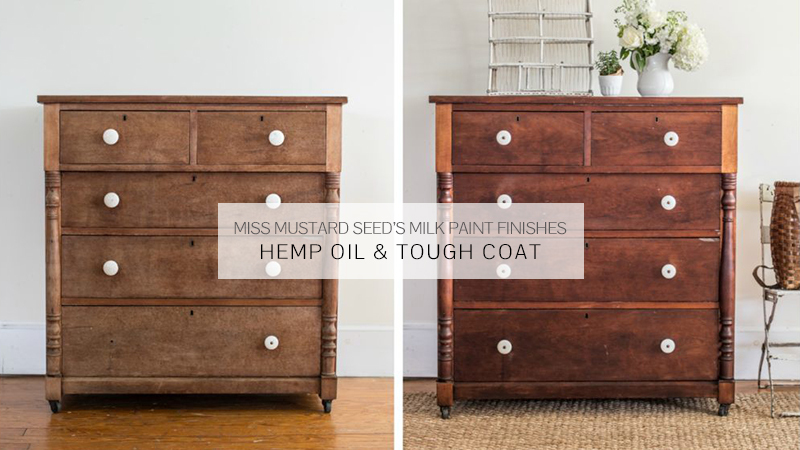 I have actually just written two posts about these finishes over on the MMS Milk Paint blog. You can read all about the waxes in the MMSMP collection here. And you can read all about the liquid finishes, including Hemp Oil, here. Take note that the order needs to be Hemp Oil first, then Furniture Wax. 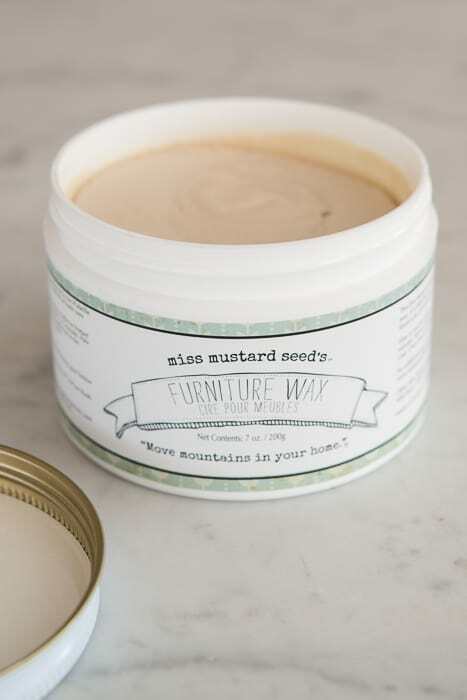 These products can’t be applied in the opposite order because the Furniture Wax won’t let the Hemp Oil soak in. A good trick for remembering the order is to follow the alphabet. 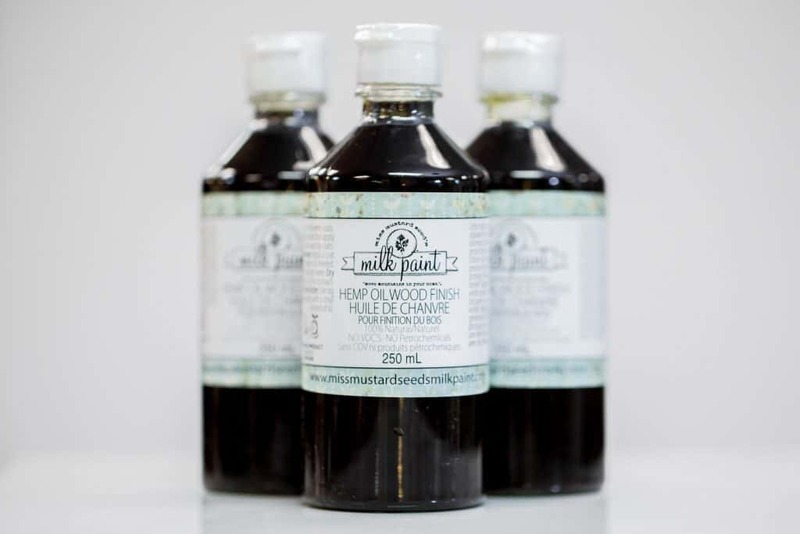 H comes before W, so apply Hemp Oil before Furniture Wax. 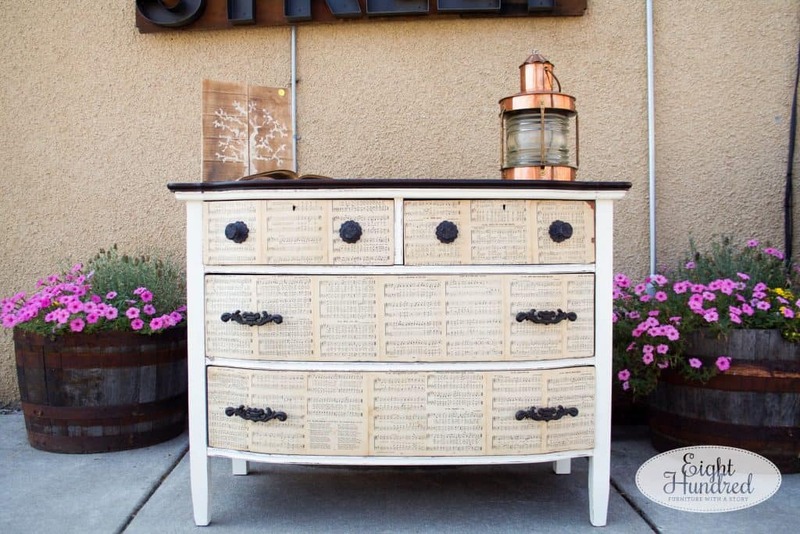 At this point, the dresser was all ready to go as far as paint and decoupage was concerned. 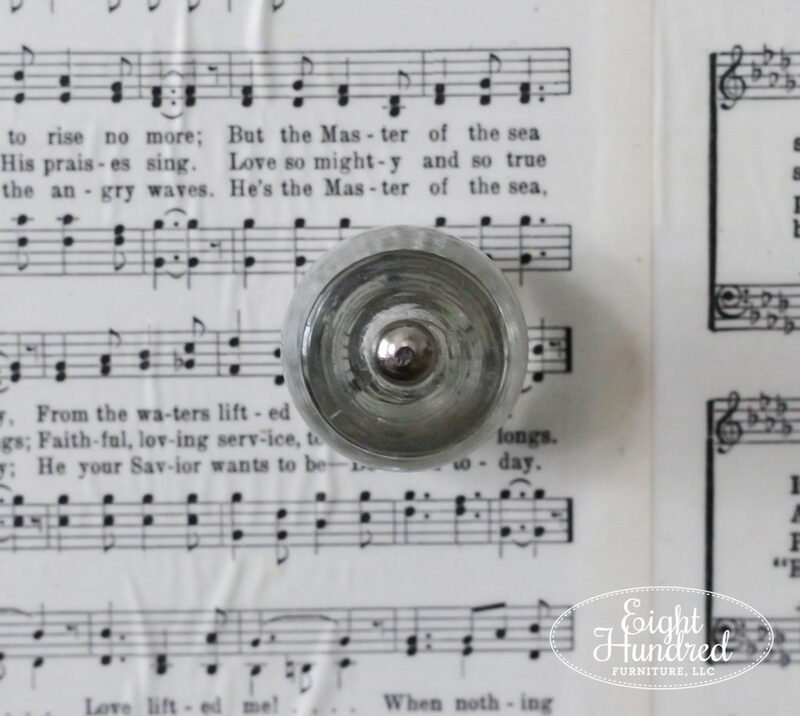 For hardware, I partnered with my friends at Rustic Brands, and they sent me the most gorgeous bottle stopper knobs. 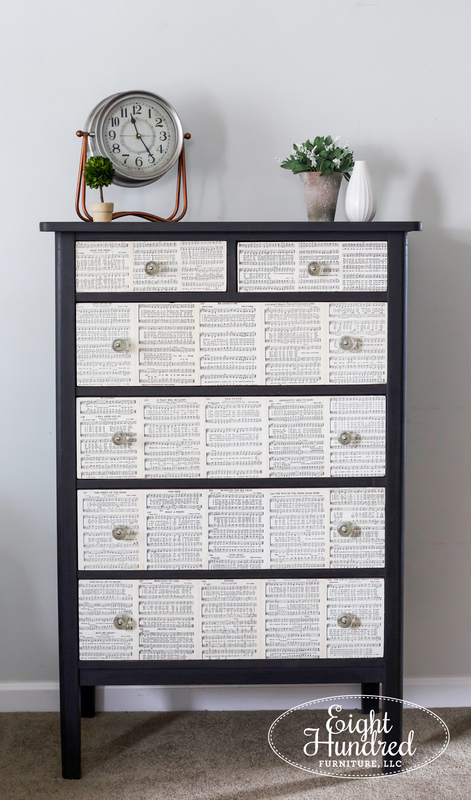 I’ve been partnering with Rustic Brands for a few months now, and prior to that, I was using them as one of my wholesale providers of hardware for my furniture pieces. They are a wonderful company to work with and I’ve never had any issues with shipping or customer service. They are quick respond, quick to ship, and everything arrives in tact! 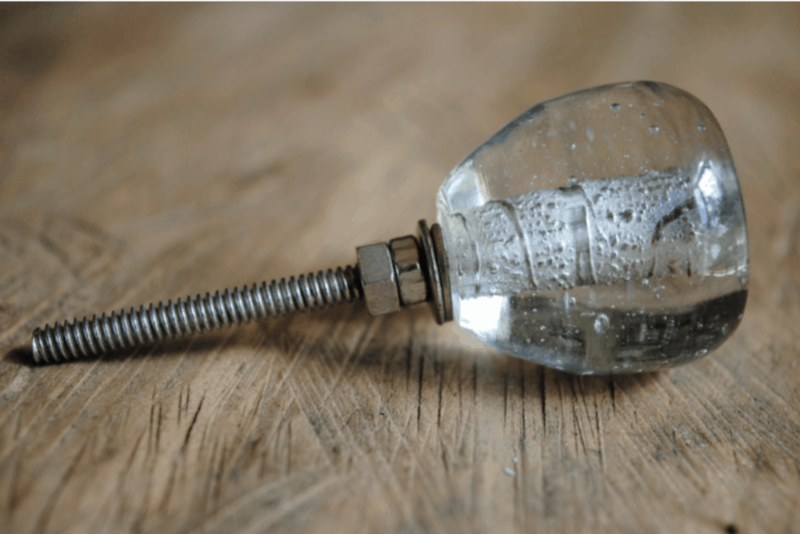 If you’re on the lookout for a wholesale provider of knobs, handles and hooks for your business, give them a look! When my knobs arrived, I noticed that I had asked for 9 knobs instead of 10. 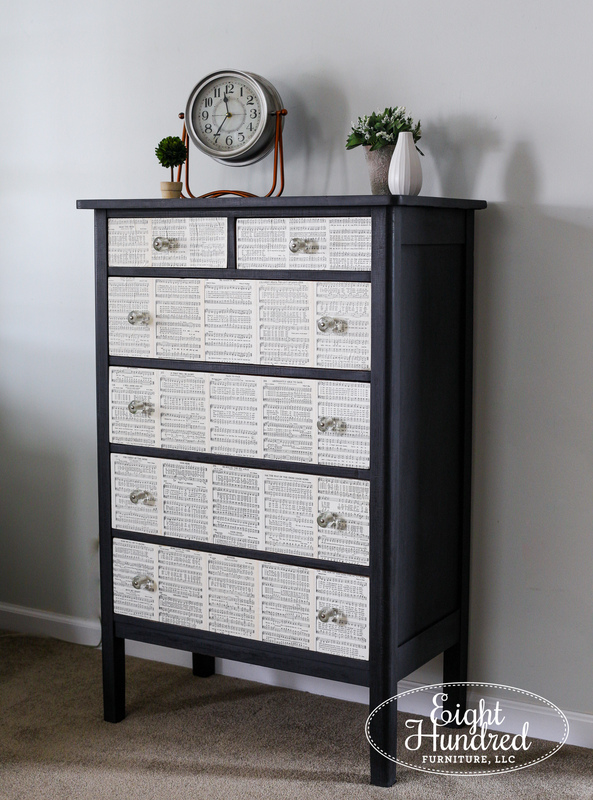 I quickly contacted my girl, Valarie, and she was so incredibly sweet to track down one more knob for me and ship it super fast so I could photograph and finish my dresser. 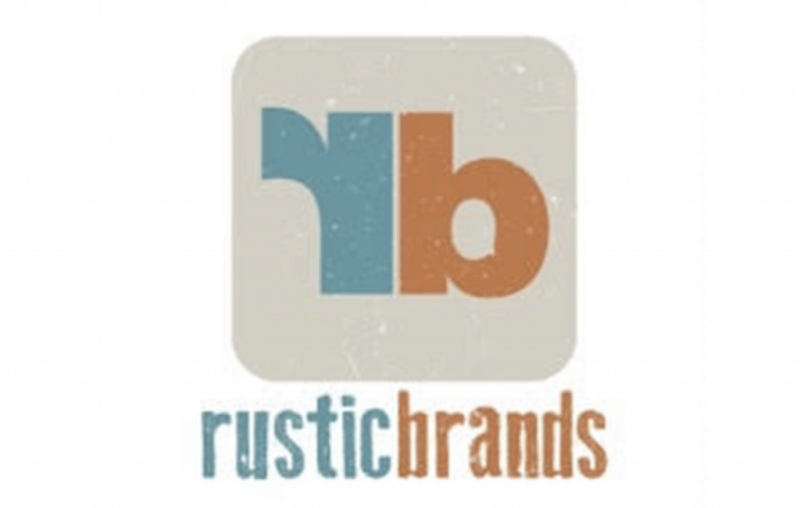 I told you Rustic Brands is awesome – especially when you can’t count! 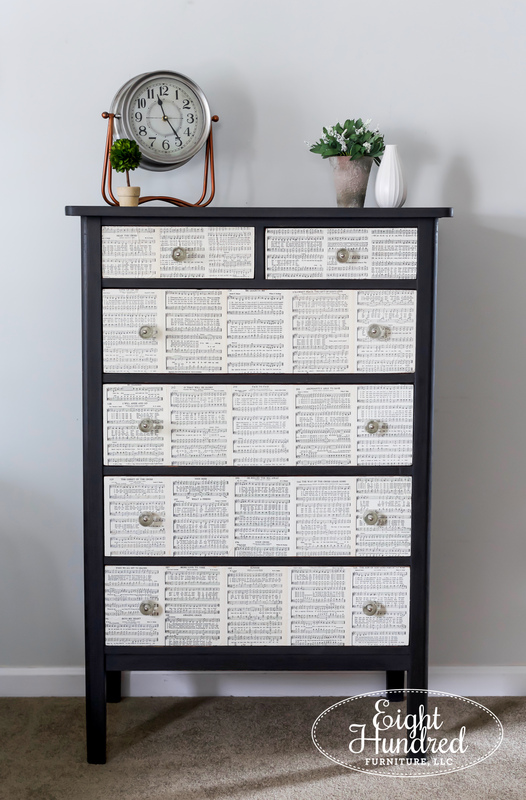 I’m so excited to be able to share this dresser with all of you today. 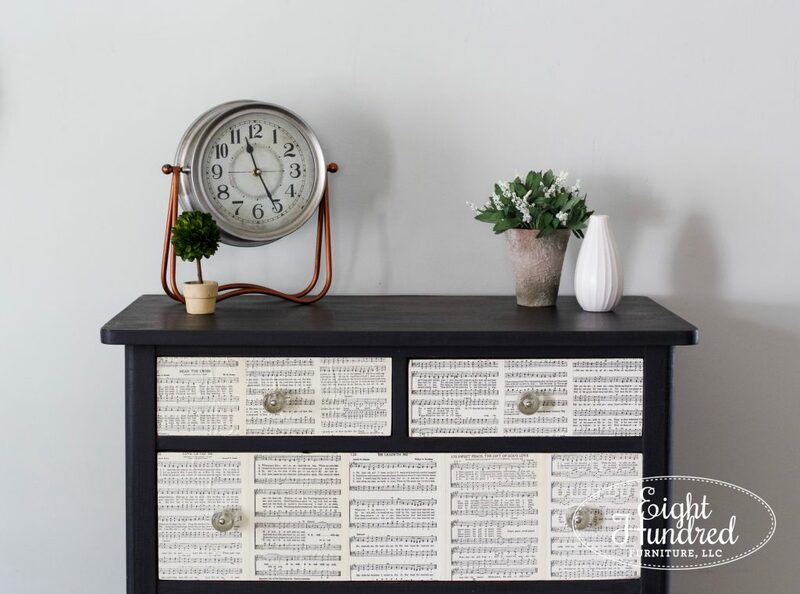 There have been so many delays in its reveal from miscounting my knobs to my website editor crashing every time I added a photo to this blog post. Despite all the setbacks, I’m proud to show off my latest sheet music piece! 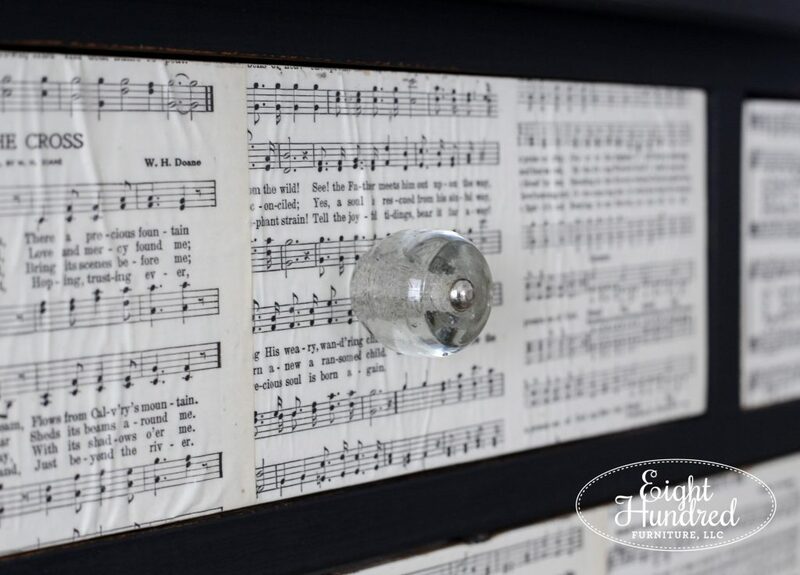 The glass bottle stopper knobs were the perfect choice for this dresser. 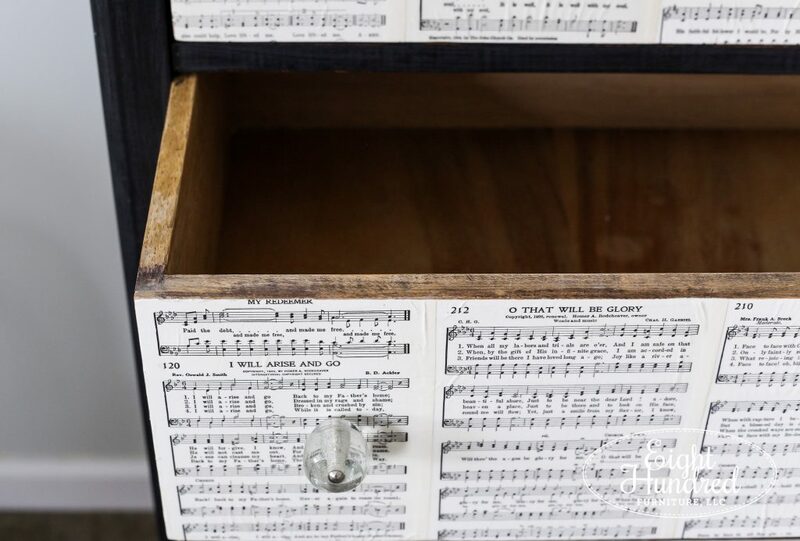 They add a bit of vintage flair, but because they’re glass, they allow you to appreciate the music on the drawers without being too “loud”. The bubbles inside of the glass are my favorite! 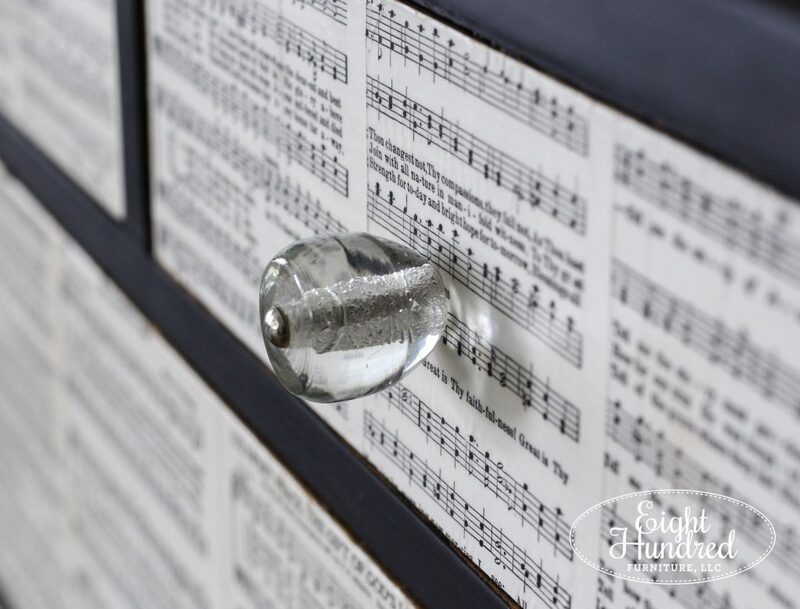 They protrude out far enough from the drawer so you can actually get your hand around them and pull, which is ideal for a piece like a dresser! Imagine having to wrap your fingers around a teeny tiny knob. No fun! My staging props will be for sale at the Spring Barn Market on April 28th if you think they’re just as adorable as I do. 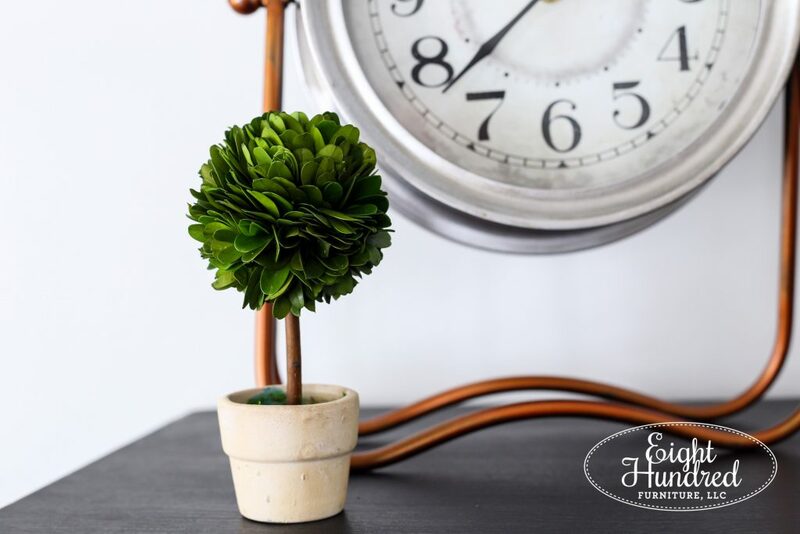 Just look at this baby preserved boxwood topiary! 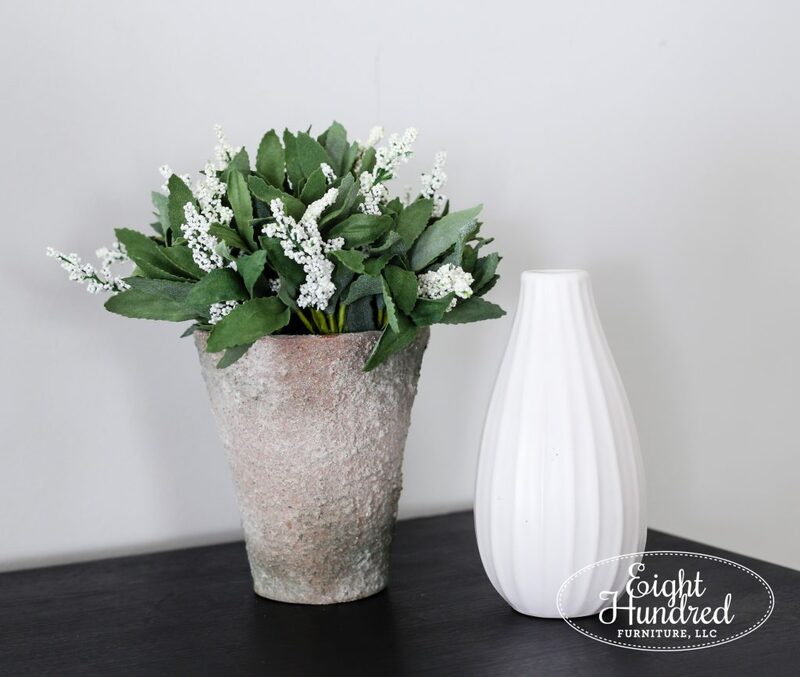 This is a faux white lavender plant. If you’d like to put a hold on this piece, you can send me an email and it will be ready for you to pick up on the day of the market from 10 AM – 12 noon. After 12 noon, it will become available for the public to purchase.